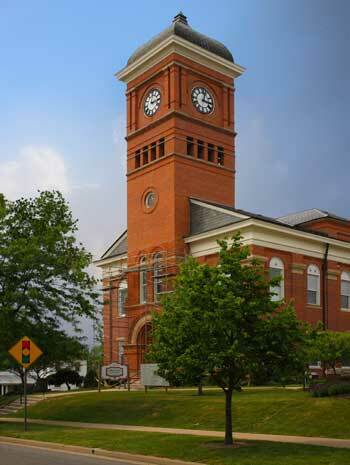 The 1848 Morrow County Courthouse is built in the Greek Revival style. Mount Gilead is the county seat of Morrow County which was named for former governor Jeremiah Morrow, Mt. Gilead was not the first name given to the village. In 1817 when the settlers began establishing roots here, they called the new village Whetstone, for the small creek running through the area. A gristmill and sawmill were built on Whetstone Creek in 1821. A few years later, Ohio officials, even then trying to be politically correct, changed the name of the creek to Olentangy in a mistaken attempt at using the original Native American name for the creek. Whether or not the villagers made a conscientious decision not to adopt the new name is not known. What we do know is that they began calling their town Youngstown. As with many of Ohio's small towns, when the postal system arrived, they required that every town have a unique name. Since Youngstown was already a large established community in eastern Ohio, they had to make another name change. With the large influx of Quakers to the area, they decided on the name Mount Gilead for the mountain in the Old Testament book Genesis where Jacob pitched his tent. In 1832 the new name was officially adopted and has remained so ever since. 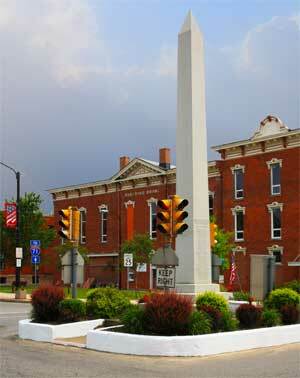 Most small towns in Ohio have one town square, Mount Gilead has two. 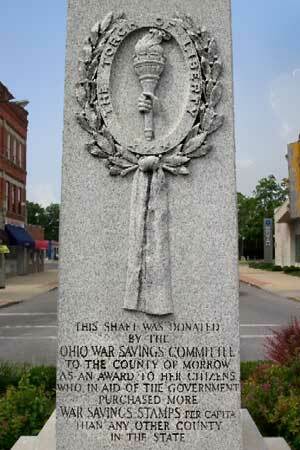 One square is known as the "south square" and is lesser known than the "north square" which contains a victory shaft in the middle.The Torch of Liberty monument was erected in 1919 as a gift form the Federal Government to Morrow County citizens after World War I for purchasing more War Bonds per capita than any other county in the state. Before the Civil War, Mt. Gilead was another common stop along the Underground Railroad. It's location on the Olentangy River made it a natural spot where freeing slaves could find refuge on their way north from Columbus. In more recent history, an oil boom occurred in Morrow County that got started in 1961 when a well was drilled on the Orrie Myers' property that began producing some 200 barrels a day. Since then numerous wells have been drilled in Morrow County. The first lake at Mt. Gilead was built in 1919 on the upper level of Sam's Creek. Eleven years later a larger lake was completed below the first one on this same tributary of Whetstone Creek. The recreational area was originally under the supervision of the Bureau of Engineering, but in 1949 it was turned over to the ODNR Division of Parks and Recreation to be maintained as a state park. Just south of Mt. 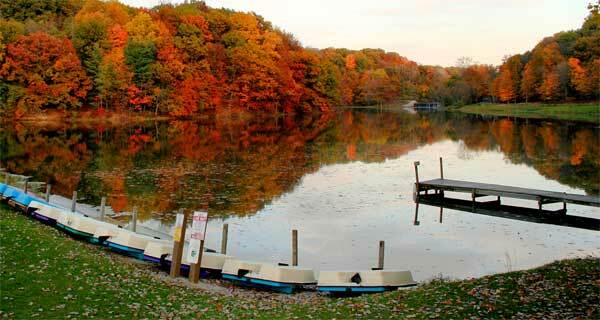 Gilead are the headwaters of Alum Creek, one of the major water sources for central Ohio residents. It is here that the creek got its name because of the abundant alum that seeped from the rocks into the small stream. Alum is still used in many industrial and cosmetic applications.